OK, now I have a lot of information on checking out cars - and I always forget to post about this. Now when I say cars - I mean vehicles: Trucks, cars, pickups, and yes motorcycles. So when I say car throughout this post it applies to all of these (within reason). Sometimes you just need to check out a car that you are going to purchase. Sometimes you may want to know if that suspiciously acquired car that a neighbor has is stolen. Well, now you do not have to report it to the police - just run a VIN Check here. 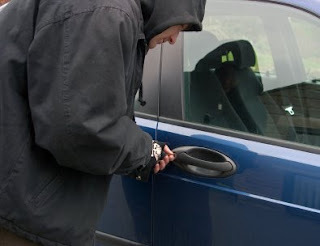 It is from the same place that trains most auto-theft detectives across the United States. So what is a VIN? It is the Vehicle Identification Number. All cars sold in the US since around 1982 have been required to have this number. On most cars you can find the VIN on the dash by looking through the windshield from the outside on the driver's side of the car. The driver's doorpost or door will also have the VIN displayed. On new cars you will find little stickers all over with the VIN. As a cop I used to get sick of hearing other cops say "VIN Number." The N is for number! Anyways, back to what I was saying. Each digit in the number means something significant from the country of manufacture to automaker to year model and the actual serial number. You don't have to be concerned with all 17 characters in a vehicle's VIN Number. For your convenience I will only speak about the key ones. The second character represents the manufacturer or make of the vehicle, as follows: A = Alfa Romeo, B = Dodge, C = Chrysler, D = Daihatsu, E = Eagle, F= Ford/Eagle, G = All General Motors vehicles (Buick, Cadillac, Chevrolet, Oldsmobile, Pontiac, Saturn)H = Honda/Acura, J= Jeep, L = Lincoln, M = Mitsubishi, N = Nissan/Infiniti, P = Plymouth, S = Subaru, T = Toyota/Lexus, V = Volkswagen. Note that the VIN Numbers tell you who really makes what - Like Nissan makes Infinity and Toyota makes Lexus, etc. The fifth, sixth & seventh characters are the car line, series and body style. These are obviously different for each make (manufacturer). The tenth character represents the year of the car. Pay close attention to this one: B = 1981 F = 1985 K = 1989 P = 1993 V = 1997 C = 1982 G = 1986 L = 1990 R = 1994 W = 1998 D = 1983 H = 1987 M = 1991 S = 1995 X = 1999 E = 1984 J = 1988 N = 1992 T = 1996 Y = 2000 1 = 2001 2 = 2002 3 = 2003 ... I am not sure what they will do for next year. Of course there are plenty of paid services like CARFAX and the like that will give you the history of the car. Nearly all car sales places will give you a CARFAX report on the car you are interested in. So get them to run it if the car is on a lot. Whatever you do concerning vehicle checks - Be Safe!! The VIN information is very interesting. I learned something new today. I will this link back you for my Car specific articles. Thanks for stopping by. Now I have to check out your stuff.